One of two such towers, according to Hellowell built in 1811 by the British Government, to act as landmarks for passing shipping to help prevent wrecks on the dangerous coast - however an advertisement in Manx Advertiser (10 April 1823) placed by T. Brine seeks masons for work on a new course for the River at Peel Harbour (ie the quay) and a stone beacon to be placed at Derbyhaven. 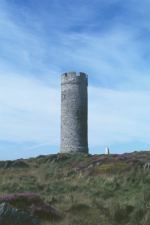 It later became known as the herring tower. The other is on Douglas Head, now forming part of the one time Douglas Head Hotel. Designed by Thomas Brine who left considerable mark on Castletown. 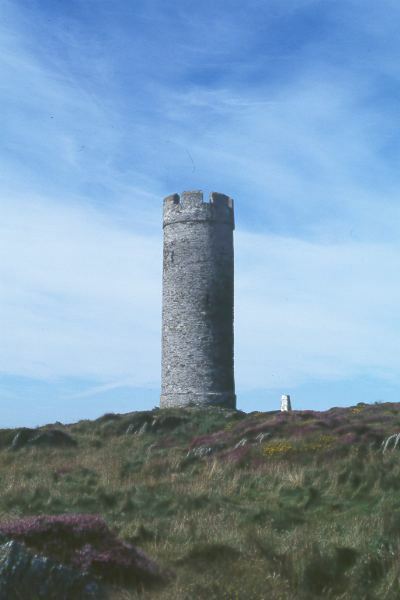 The two towers are heavily based on the round tower at Peel Castle (sharing same diameter, entrance door etc) which may be significant if it is to be identified with the 1823 Derbyhaven stone beacon.